Through the years some makers have considered Ivory as an essential choice when it came to building fine musical instruments, from pianos to fine violins. Ivory can be found in an assortment of animals like a warthog, walrus, whale, and hippopotamus. However, the ivory found in Asian and African elephant tusks has always been in the highest demand, with the unfortunate consequence of creating a black market that has greatly harmed elephant populations. Ivory sourced from prehistoric mammoth and mastodon ivory, both mammals that had become extinct thousands of years ago, have also been used. Most of the instruments of antiquity that use ivory have used ivory from these prehistoric mammals. 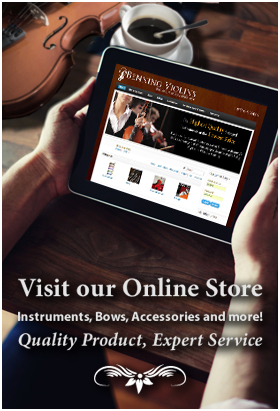 Aside from pianos and violins, ivory has also been utilized in stringed instrument bows, such as viola, cello and violin bows. Ivory is made up of dentine and can be found in the teeth, antlers, horns or tusks of certain animals. Dentine is a dense, bony tissue that can be found underneath the enamel of a tooth. The dentine found in ivory consists of both inorganic and organic tissue. The inorganic tissue keeps the ivory rigid and strong. The organic tissue helps the ivory grow and repair itself when damaged. Researching the growth structure and composition of dentine allows for identification in types of ivory. 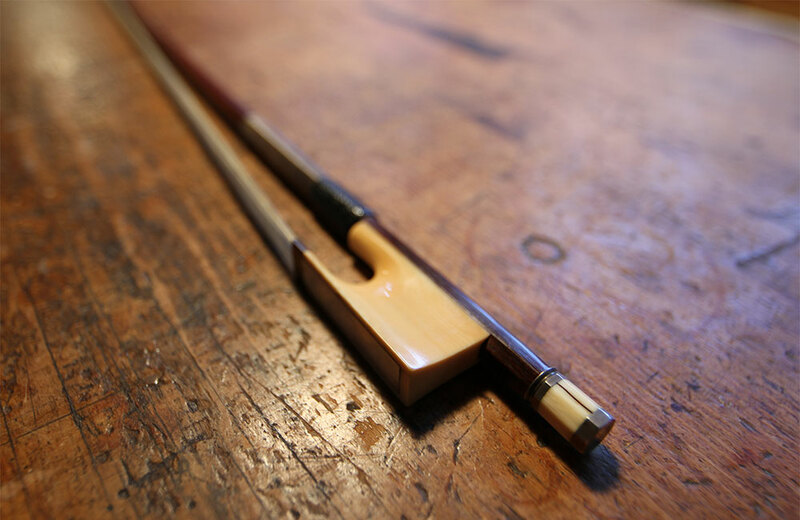 Many parts of the violin and bow have been crafted with ivory. The most common use of ivory is in the tip plates of the bow. The frog of the bow can also be made up with ivory. The frog of the bow is located on the opposite end of the tip and is used to hold the bow hair in place. The frog of the bow can adjust the tightness of the bow hair. Various metals or bone can also be used in substitution of ivory on the bow. Although it is not as common, ivory can also be found in violin pegs and tailpieces. Violin pegs are located in the scroll of the violin and are attached to an individual string. Violins can be tuned by manipulating these pegs. The tailpiece anchors the opposite end of the strings. Ivory is used because of its strength and durability, but it can also be difficult to maintain. Light and age can bleach the color, while humidity and temperature can be damaging to the composition of ivory. If ivory is kept in low humidity, the ivory will shrink and crack. In high humidity the ivory will swell up and warp in shape. Ivory has many pores throughout its surface; therefore contact with natural oils from skin can cause it to darken over time. Most liquids, even water, can damage ivory. While ivory is durable and strong, it is mostly used because of its aesthetic beauty, which over the years has contributed to the high quality and appearance of fine instruments, particularly those of antiquity.